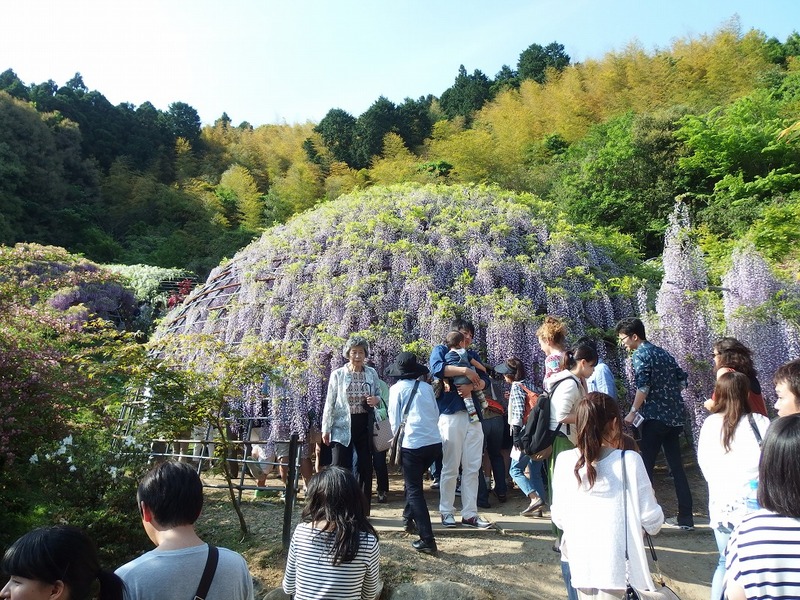 Kawachi wisteria garden, (Kawachi Fuji-en:河内藤園 in Japanese) which I’m going to introduce this time, became a popular place for a lot of tourists from both domestic and overseas in recent years. Although its presence is spread by SNS internationally, it is a little hard to find information about the garden. This garden is the private garden and as to avoid the damage to the wisteria by too many tourists, there is no advertising or official website. 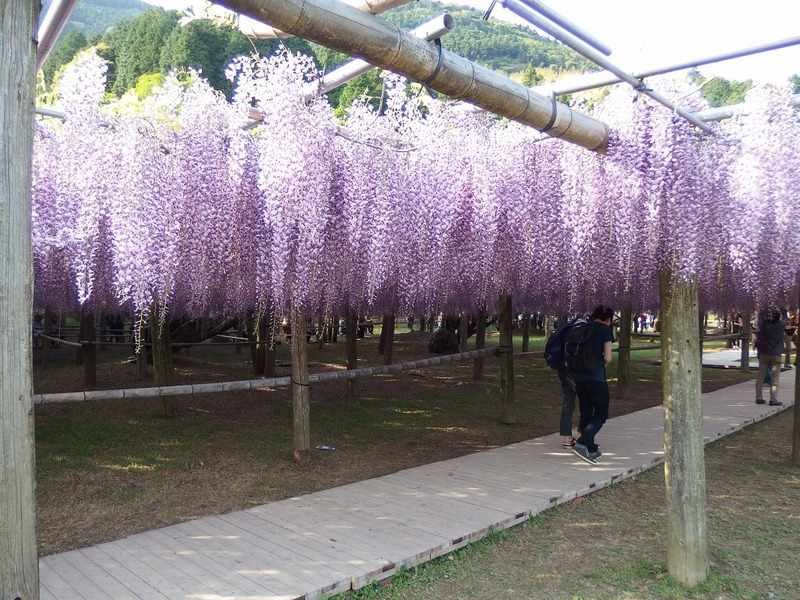 I went to this wisteria garden in May 2015, so I’m going to introduce the latest information on the garden. Admission to the garden is now to be limited from 2016. 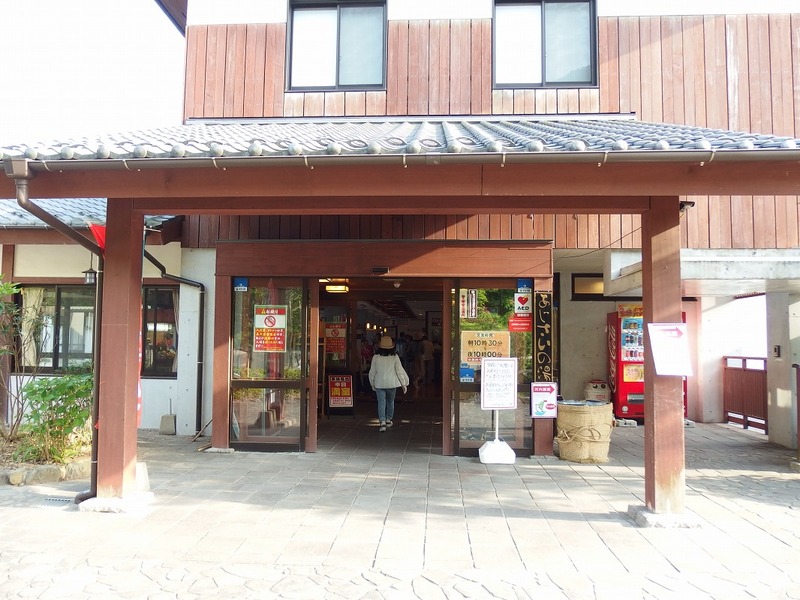 Because of the traffic congestion relief, you need to purchase a ticket at a convenience store. 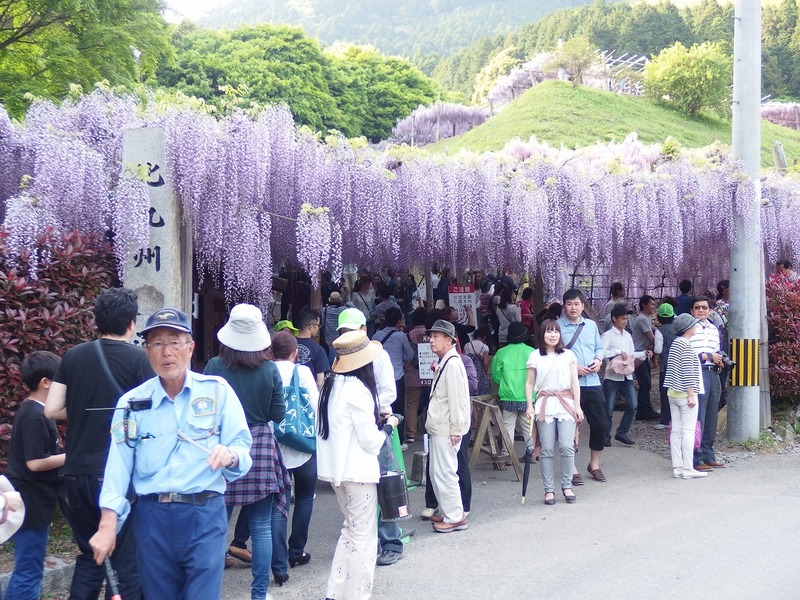 You can not enter the garden during 4/27 (Thursday) ~ 5/11 (Thurs) unless you purchase a ticket at a convenience store of Seven-Eleven or Family Mart. *Tickets from 5/8 (Monday) to 5/11 (Thursday) will be sold from 5/1 (Monday) AM 6 o’clock. Kawachi Fujien: 093-652-0334 For more information: Official website of the Kawachi Fujien. What is Kawachi Fuji Garden? 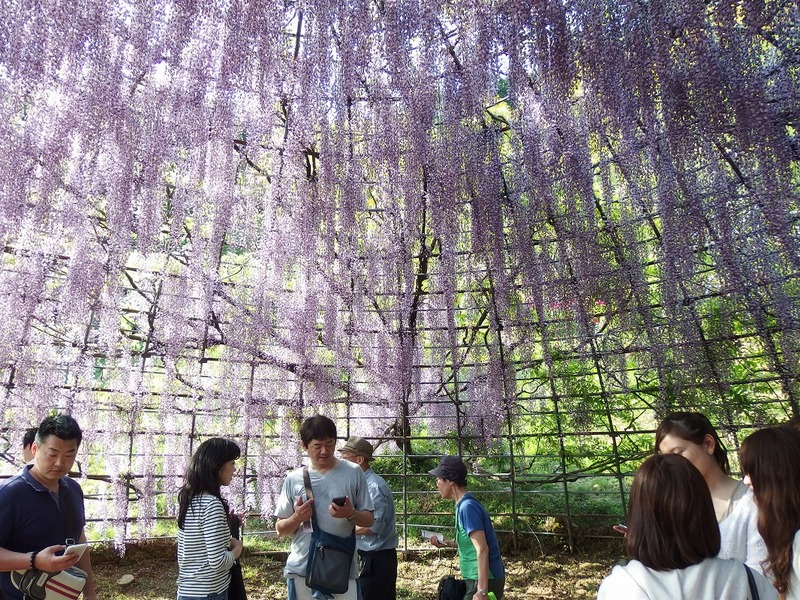 Kawachi Fuji Garden is located in Kitakyushu-shi (北九州市) in Fukuoka, it’s the private wisteria garden that opened by Masao Higashi in late 1977. 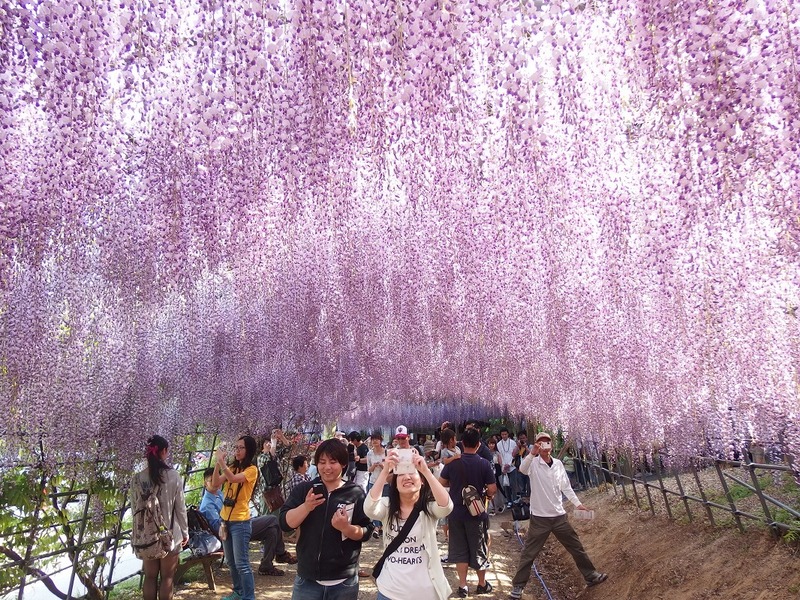 The best season for watching wisteria flower is from mid-April to mid-May, but the date varies depending on the flowering situation of wisteria of the year. 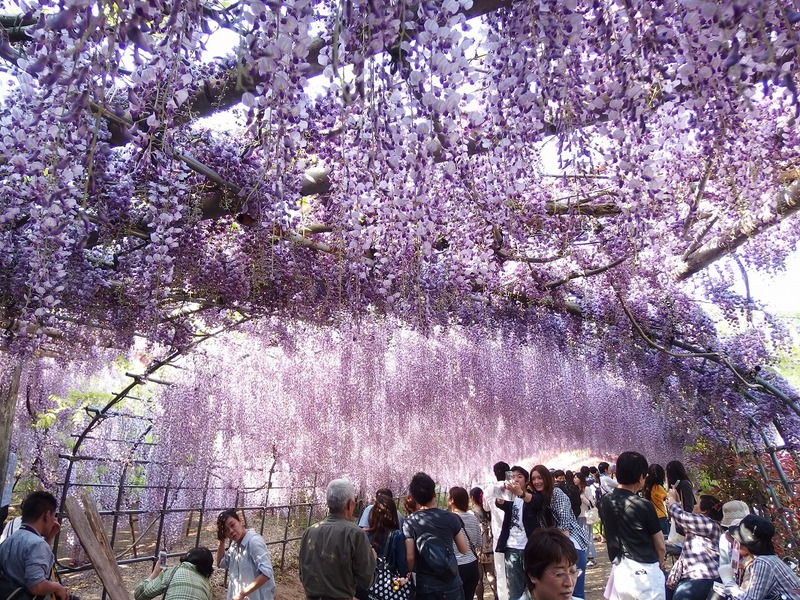 There are tunnels of 80m and 220m, a dome of wisteria, a wisteria trellis, and a large wisteria trellis in the garden. 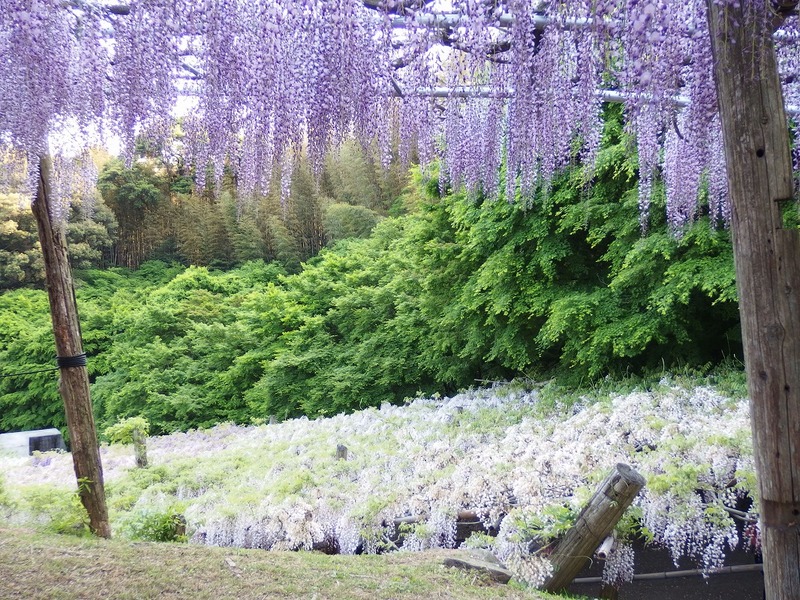 The garden opens for visitors only in spring for wisteria and the time of autumn leaves. 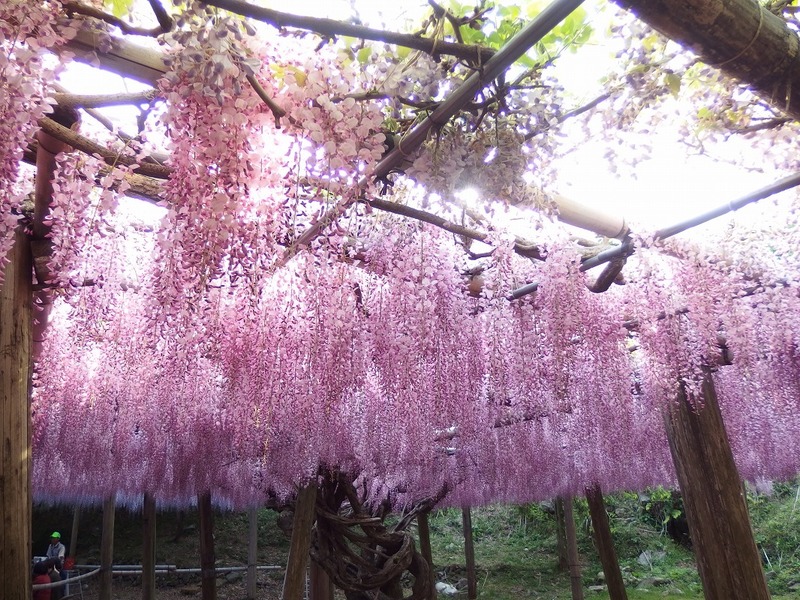 Admission fee depends on the flowering situation of wisteria, between 300 yen to 1000 yen. 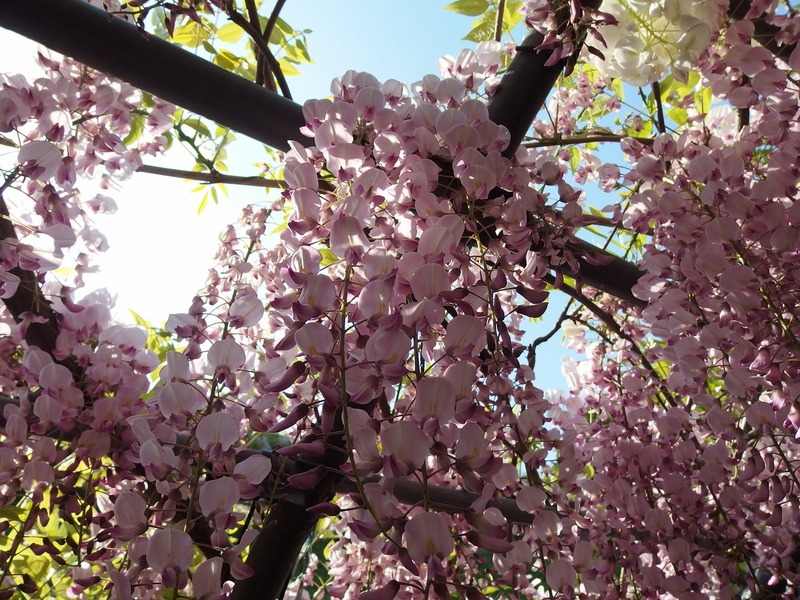 It’s hard to expect a certain date but seems to have reached a full bloom during annual Golden Week (Golden Week is a period of consecutive holidays from the end of April to early May every year in Japan). Please refer to the flowering information of 2015 as a reference. 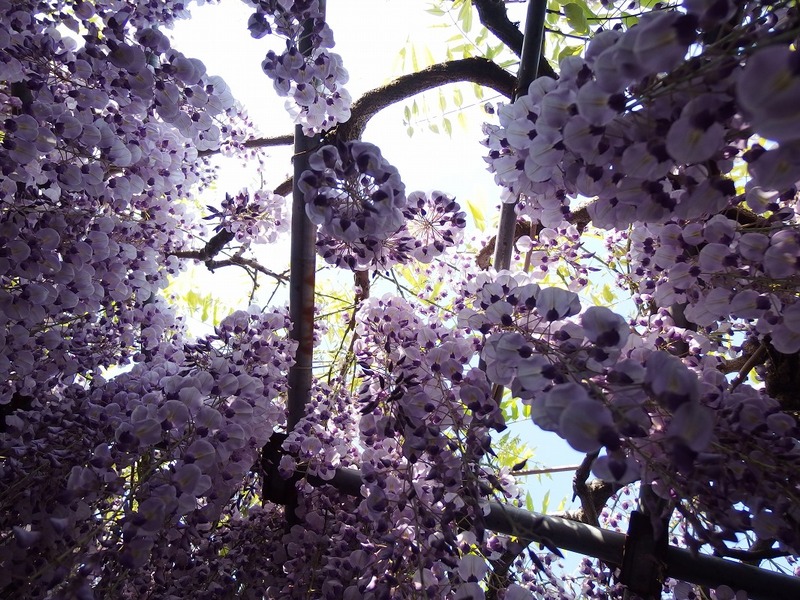 April 28: 50% to 60% of the flowers are in bloom. May 1: In full bloom. May 8: Full bloom past but still possible to watch. May 11: It’s the end of the season for 2015. 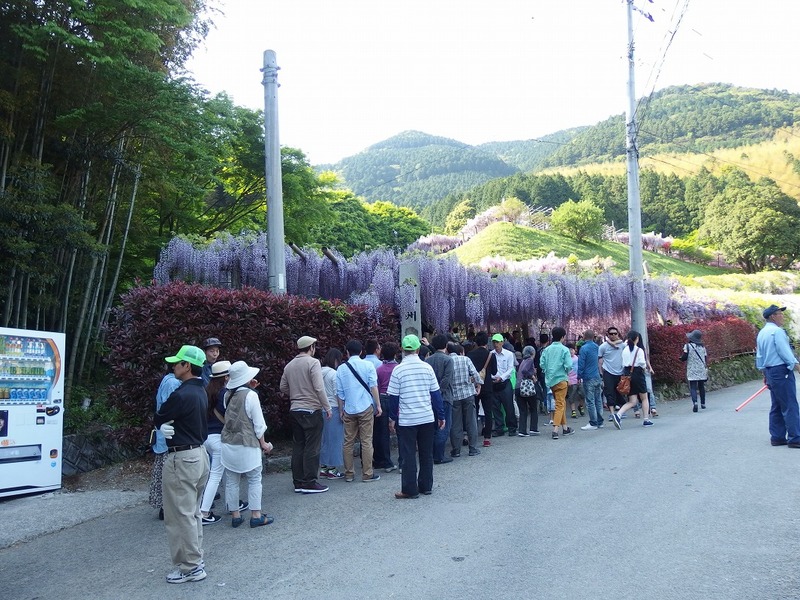 How to access to Kawachi Fuji Garden? The garden is located in the mountains, so it’s a little hard to access. I’ll show you some of the ways to get there from JR Yahata station (JR八幡駅), which is the closest station to the garden. If you come from Fukuoka airport to this Yahata station, take a subway to go to JR Hakata station (JR博多駅) and change to a JR Kagoshima line (JR鹿児島本線) to get there. 1. 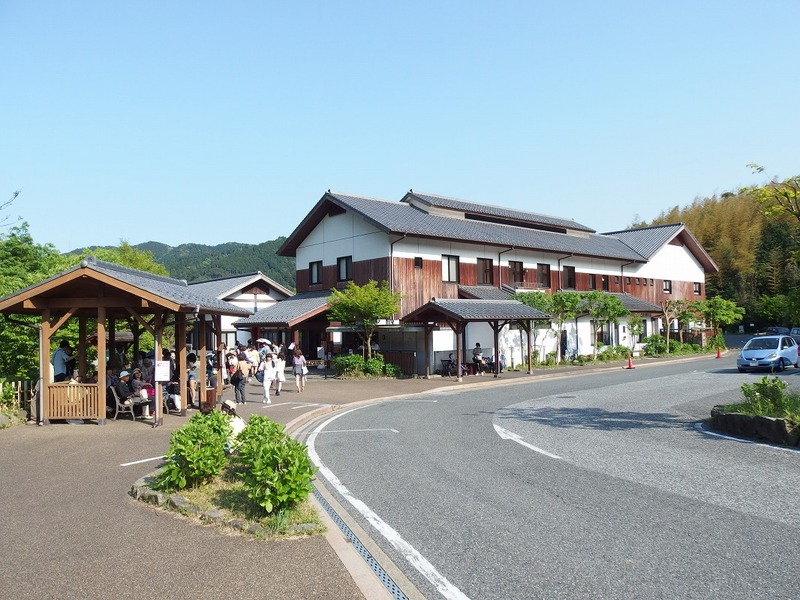 Nishitetsu bus & walk: Take Nishitetsu bus (西鉄バス) from JR Yahata station to “Kamijyuta;上重太” bus stop and walk from there about 50 min. This is the route I used this time. Bus fee is 260 yen. 2. 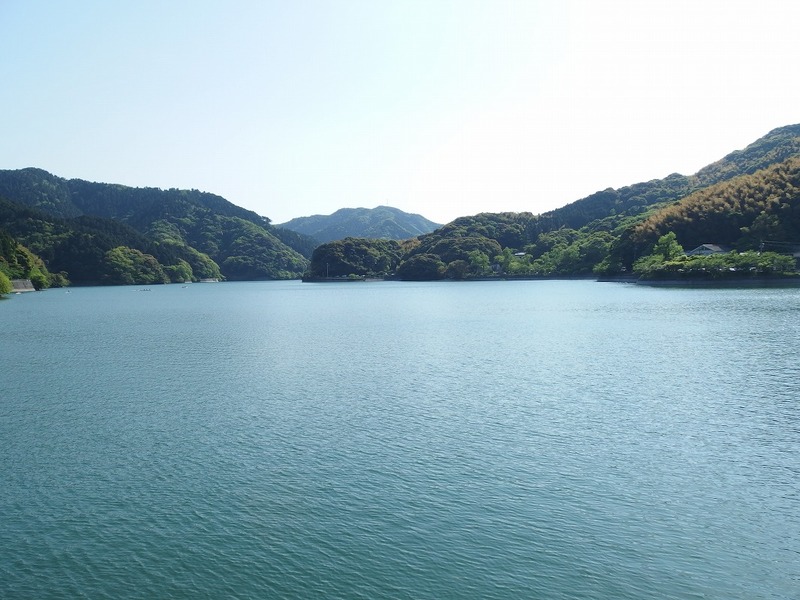 Free shuttle bus: Take a free shuttle bus organized by “Ajisai-no-Yu;あじさいの湯”. Ajisai-no-yu is close to the garden just walk by 3 min. But this hot spring facility is not related to the garden. So if you plan to use this bus, it’s a better idea to use this facility such as hot spring or buy something at there. Actually, there is no restaurant or store around the garden except this facility. 3. Cab: Take a cab from JR Yahata station (JR八幡駅). One way will be around 3000 yen, but it’ll be higher in the holiday season. 4. 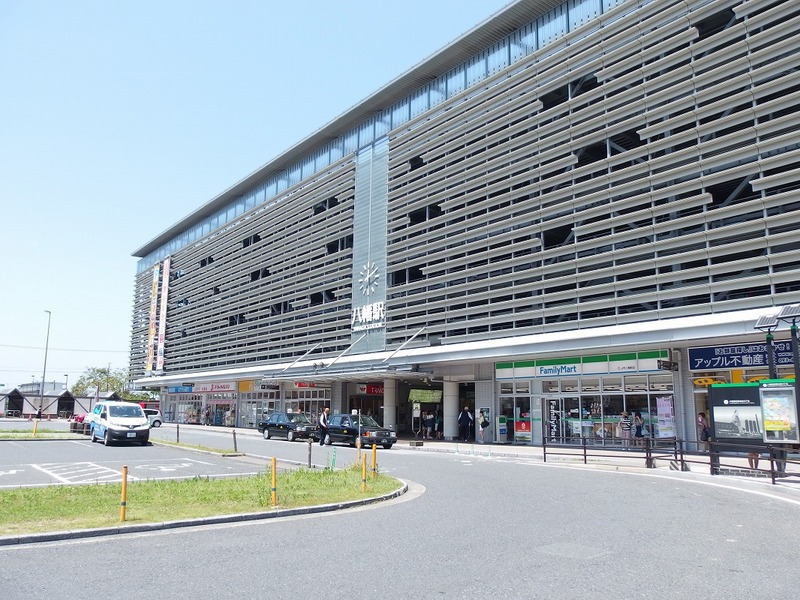 Car rental: Rent a car around JR Yahata station (JR八幡駅) or JR Kokura station (JR小倉駅). It’ll be easy to find a hotel or a restaurant if you plan to stay around JR Kokura station. The best way is to visit there before the garden opens to avoid the busy traffic. Otherwise, the following ways are the choices. If you don’t mind sitting in a small seat for a long time, then take a free shuttle bus to “Ajisai-no-yu”. It usually takes only 30 min but it’ll be at least 3 hours or probably more during the Golden Week due to the traffic jam. And also many tourists will take this bus, so you probably have to wait in the long line another hour or 2 to get on a bus. The fastest way is using the Nishitetsu bus. Because there is only one road to get to the garden, there will be a huge traffic jam. The bus takes you until “Kamijyuta” bus stop. Then walk about 50 min of uphill exercise course. It’ll take less 3 hours (bus 2 hours + walk 50 min). Nishitetsu bus #56 used to get to the bus stop “Kawachi-syogako-mae(河内小学校前)”, which was nearest bus stop to the garden, but the route shortened in 2011. Now Nishitetsu bus goes until the destination of “Kamijyuta-上重田” bus stop. 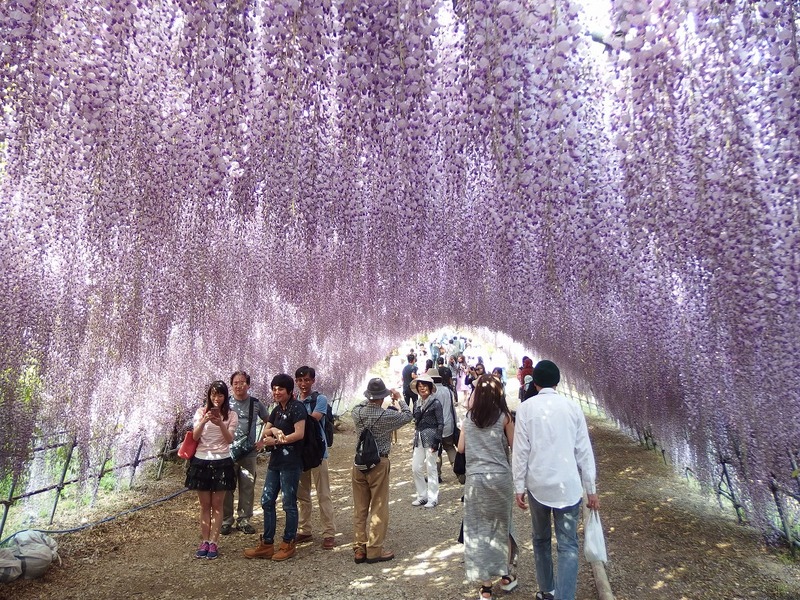 Let’s go to the Kawachi Fuji Garden! Arrived at JR Yahata station in the afternoon. I took a Nishitetsu bus from JR Yahata station because there were too many tourists waiting for the free shuttle bus to get to the garden. After sitting in a small seat about 2 hours, I arrived at “Kamijyuta; 上重田” bus stop. 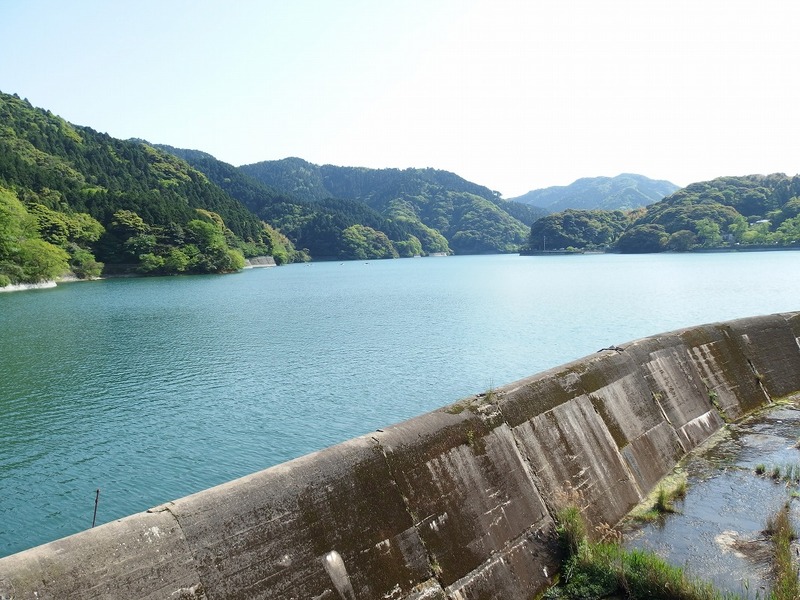 Below photos are Kawachi dam. We can enjoy the scenery while walking. Serious traffic jam. Walkers were seriously faster than those cars. After 50 min of walking, arrived at “Ajisai-no-yu; あじさいの湯”. If you took a free shuttle bus, the bus drops you here. You can take a bath here after visiting the garden. There is no restaurant or store around the garden except this facility. Finally arrived at the Kawachi Fuji Garden. The entrance fee was 1000 yen this time. 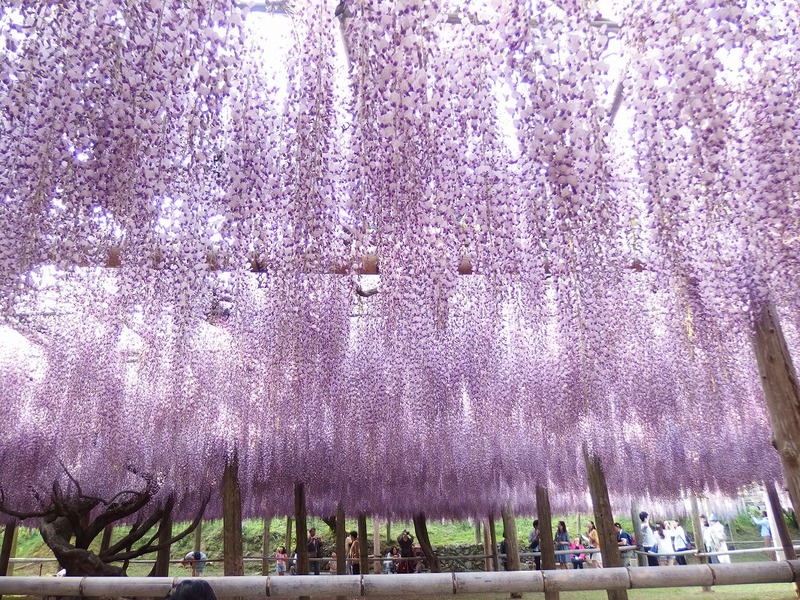 It means the wisteria flowers are in full bloom. So many people were there. I think one-third of them were tourists from overseas. 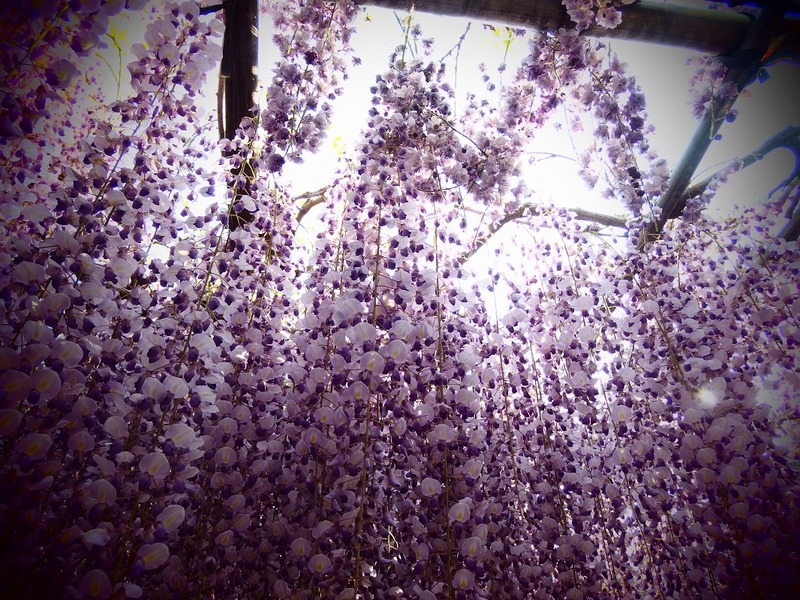 The first view of wisteria flowers. Well, I had never seen the view like this in my life. 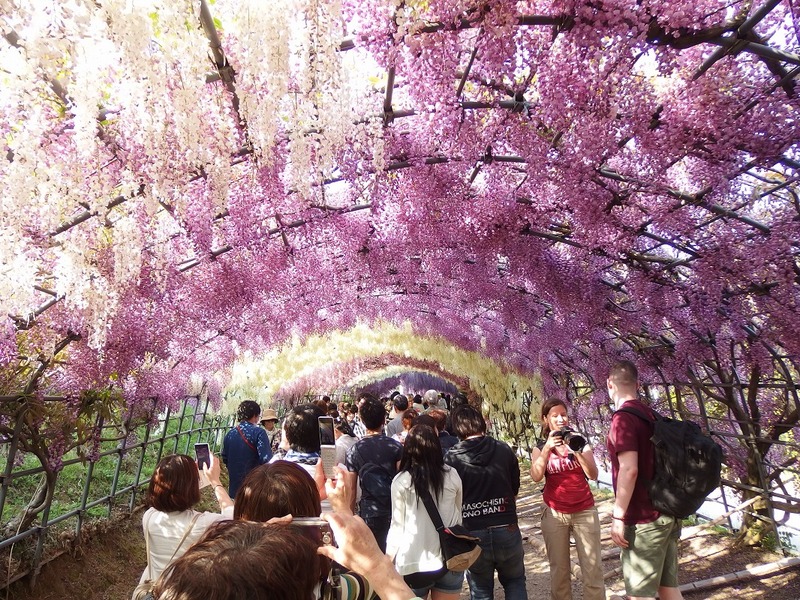 Walking through the wisteria flower tunnel. 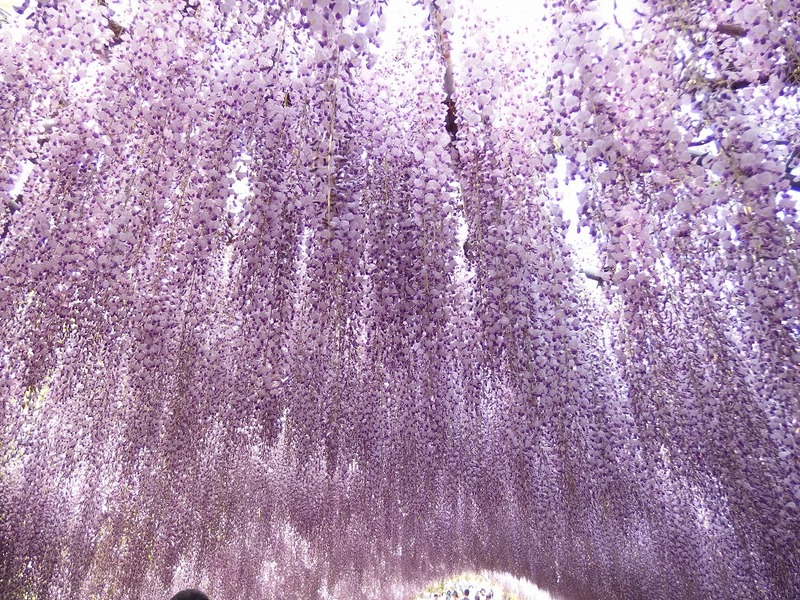 There were different colors of wisteria. A popular spot for photography. Wisteria has come down to the front of the eyes. 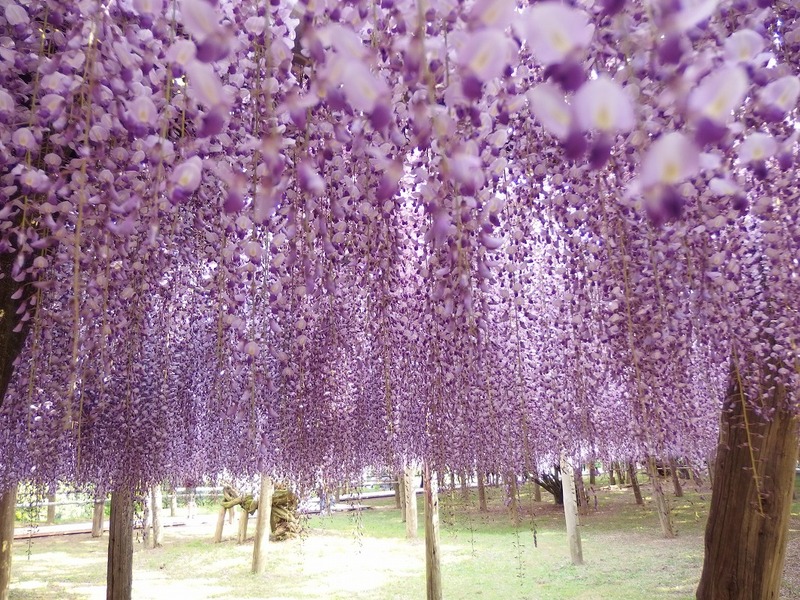 Wisteria dome. We can get inside of it. 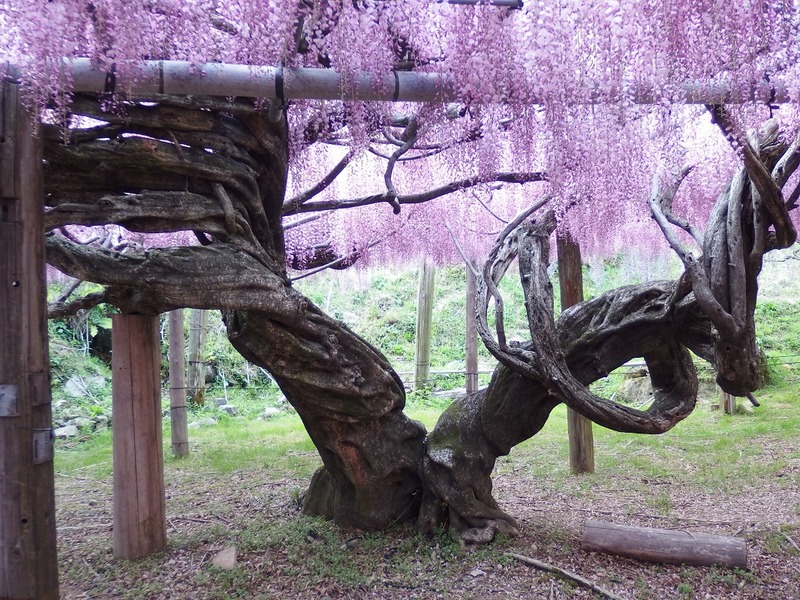 Pink wisteria with a huge tree. We can’t stand straight at some part of the garden. 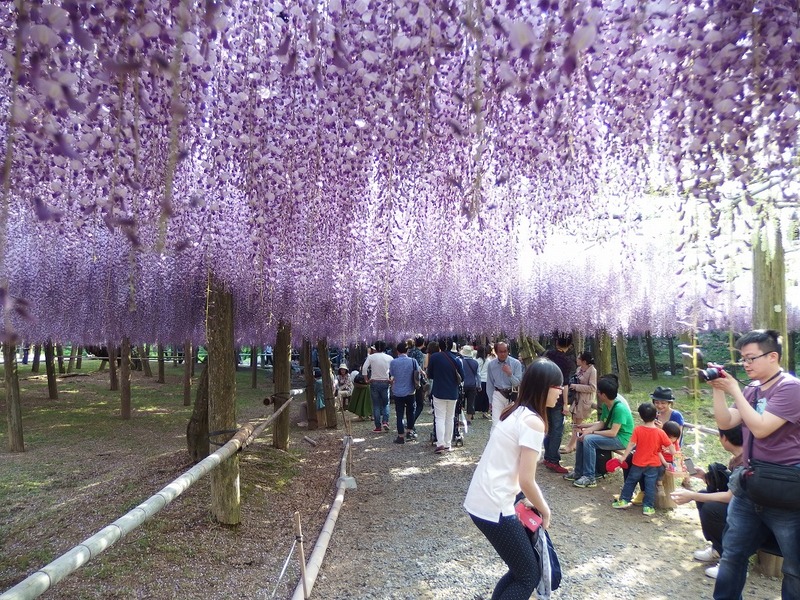 If you don’t walk by bending your waist, your face will touch the wisteria. 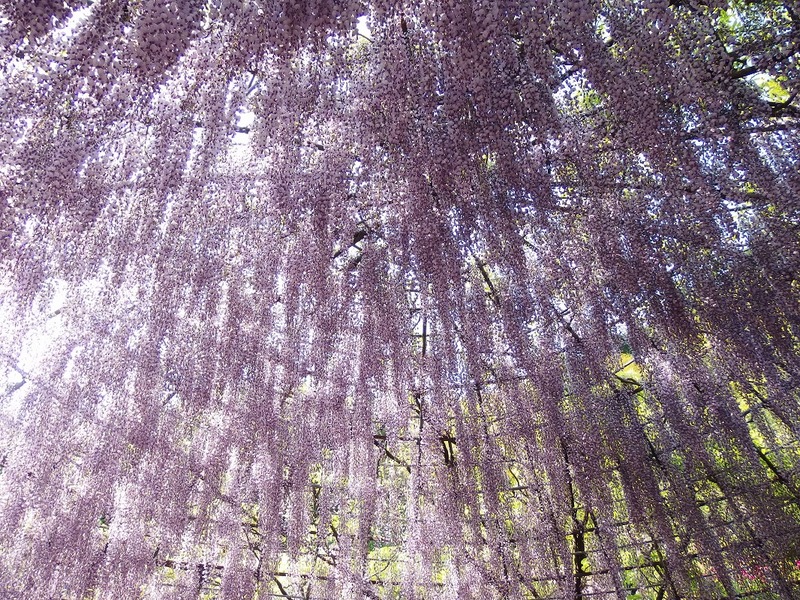 Large wisteria trellis which spread over the head. 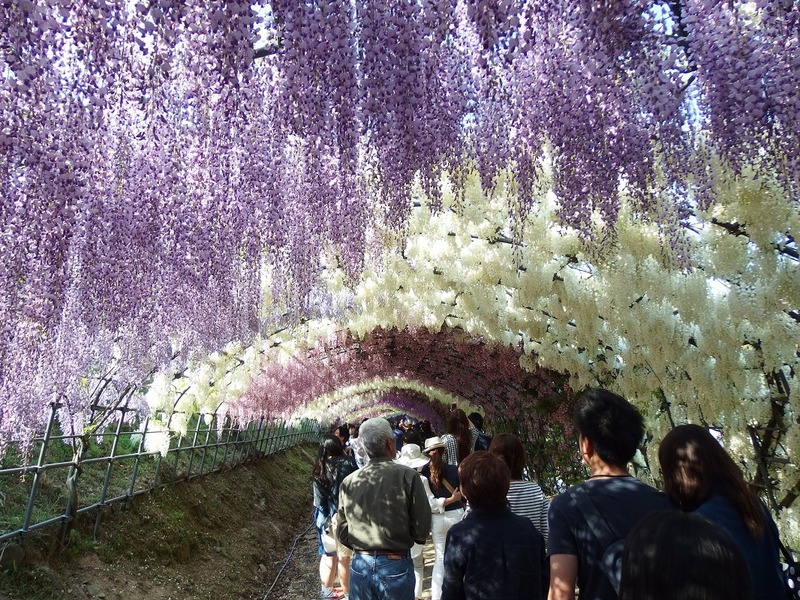 You can see the long wisteria tunnel from some of the view points. 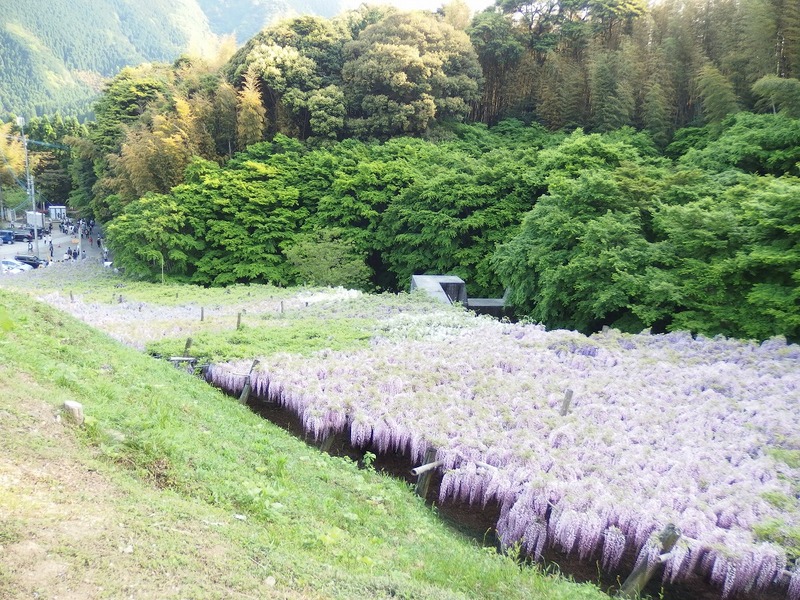 Opening season: Late-April to Early-May for wisteria flower, Mid-Nov to Mid-Dec for Autumn leaves. Access: Please check at the top of this page. Parking information: Free parking lot for 200 cars. 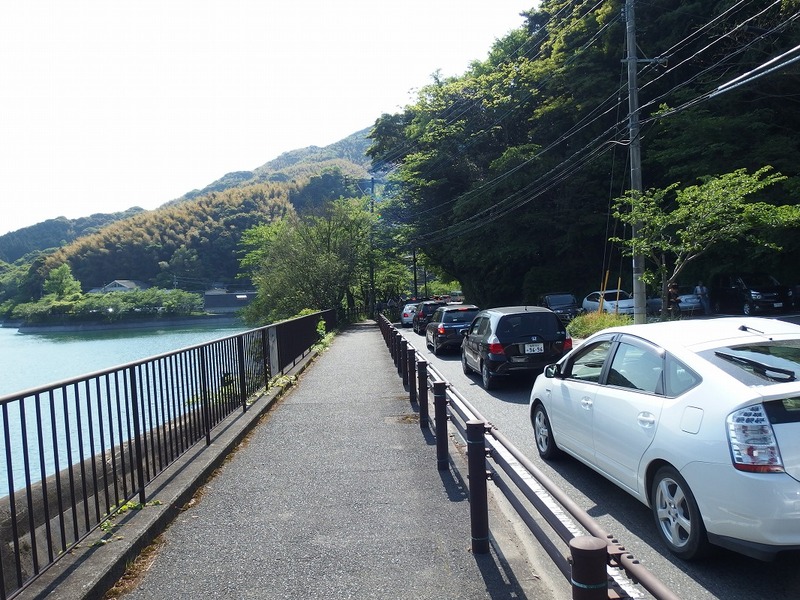 There are some more parking areas around the garden, but seems there aren’t enough space for tourists in Golden Week. ← Japanese traditional hotel 『Ryokan』 & one of the top three biggest hot springs for 『Bihada-美肌』(beautiful skin) in Japan, Ureshino hot springs.